Log in to your StatusCake account, and go to the Integrations section. In the Integrations drop-down box, select the Telegram option. You will be presented with a link, click this to go to a confirmation page. On this page you may be asked to log in to Telegram if you aren’t already, following that use the “SEND MESSAGE” button to confirm the creation of the new integration. You should see the “/start” command submitted to the new “StatusCake” channel, which is where alerts will arrive in future. 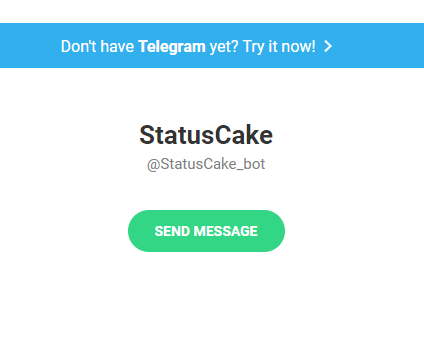 To finish up, on the StatusCake end, just ensure that your new Telegram integration is added to a contact group, from there all tests with that group assigned will send an alert to Telegram.